The expression ‘crony capitalism’ is used quite often and there is a general understanding about it. India ranked 9 out of 23 countries included in the analysis. In 2016, the analysis included 22 countries and India again ranked 9. The essence of crony capitalism is a relationship between business and politics. And Budget 2017 is arguably the most significant governmental action to facilitate development of a cosy relationship between businesses or corporates on the one hand and political parties on the other. Some of the salient features as to why this stands true are described below briefly because these have been discussed in the public domain ever since the Budget was presented in Parliament on 1 February. “India is the world's largest democracy. Political parties are an essential ingredient of a multi-party Parliamentary democracy. Even 70 years after Independence, the country has not been able to evolve a transparent method of funding political parties which is vital to the system of free and fair elections. An attempt was made in the past by amending the provisions of the Representation of Peoples Act, the Companies Act and the Income Tax Act to incentivise donations by individuals, partnership firms, HUFs and companies to political parties. Both the donor and the donee were granted exemption from payment of tax if the accounts were transparently maintained and returns were filed with the competent authorities. Additionally, a list of donors who contributed more than Rs 20,000/- to any party in cash or cheque is required to be maintained. The situation has only marginally improved since these provisions were brought into force. Political parties continue to receive most of their funds through anonymous donations which are shown in cash. Subsequently, the Finance Bill 2017 was introduced in the Parliament to give effect to the announcements made in the Budget speech. The Finance Bill contains concrete and specific proposals for amendments of various law to implement budget proposals. The so-called proposal to “reduce the Rs 20,000 limit to Rs 2,000” really meant nothing at all. This is clearly shown by the amendments proposed to the Income Tax Act and the Representation of the People Act, as detailed in the Finance Bill 2017. The above clarification was fully supported by the amendments to Section 13A of the Income Tax Act and to Section 29 of the Representation of the People Act, proposed in the Finance Bill. These amendments amply ensure that the “electoral bonds” will “keep the donor anonymous”. The Finance Bill 2017 was not the end of facilitation of crony capitalism. The best, or the worst, was yet to come. It came on 20 March when the Finance Minister gave a “Notice of Amendments” to the Finance Bill in the Parliament. 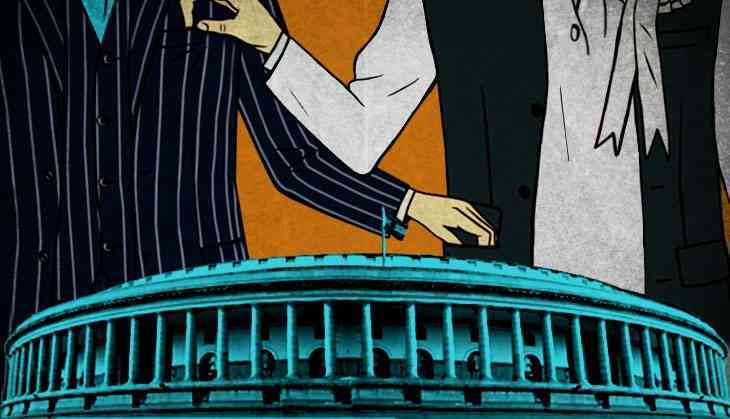 Among the 40 odd amendments, two were of special significance to promoting crony capitalism. The first removed the limit of the percentage of profits that a company could donate to political parties. This limit, which was originally 5% but had been raised to 7.5%, was completely removed by one of the Amendments to the Finance Bill. This has been done by removing proviso to sub-section (1) of Section 182 of the Companies Act 2013. The second is even more interesting. Sub-section (3) of Section 182 of the Companies Act 2013 required that a company making donations to political parties shall disclose “particulars of the total amount contributed and the name of the party to which such amount has been contributed” in its profit and loss account. The “Notice of Amendments” to the Finance Bill removes this requirement of disclosing the name of the political party. Now a company making a donation to a political party will not need to disclose the name of the party. The actions listed above, taken together, ensure that a company can donate any amount of money to any political party, and no one will know who has given how much money to whom. This is the most effective way of facilitating a cosy, or crony relationship between business corporations and political parties. As a result, India is well on its way to rising in the list of Crony Capitalism Index of the Economist. Did anyone say India is not moving up? Jagdeep S. Chhokar is a former professor, Dean, and Director In-charge at IIM, Ahmedabad. Views are personal.